Guar seed and Guar gum price will ride the upward price movement of crude oil. With growing fear of escalation of tension between Saudi Arabia and Iran, crude oil prices are rising slowly and slowly. It has crossed the level of USD 70/barrel. USA has also pulled it out from the deal with IRAN for nuclear missile development. There are chances of escalation of war between Iran and Saudi Arabia. Yeman based and Iran backed Hauti insurgents are using missile attack on Saudi Arabia and Saudi Arabia is reverting the attack in the same manner. OPEC countries are cutting the production of crude oil to support the oil prices. USA is using this opportunity and increasing its market share by increasing the crude oil production. The trade war between China and USA will also increase the tension. Crude oil will get support from geopolitical elements. This year all the fundamental factors are positive for upward guar seed and guar gum prices movement. Production of gaur seed was limited and lower than the previous year. As per available market information, production guar seed has estimated around 80 lac bags. By the end of January, there was the export of 4,05,625 MT of guar gum. Speculators are taking advantage of favorable conditions. The market is highly speculative at this moment. As per market conditions, prices must be around the level of 5000/100 Kg and Guar gum must be above 10000/100Kg. Guar Churi, guar korma which is the by-product of guar gum processing industry are being traded at the strong level. The new crop of guar seed will come after 8 months, the arrival of guar seed will be remaining limited for next 7-8 months. The industry will full fill the demand with existing stock. Availability of raw material is very limited. Consumption of guar gum powder is increasing with increasing crude oil prices. Guar seed and guar gum prices are strong in the local markets. Prices of guar seed and guar gum are quoted higher than Commodity exchanges. Future trading of guar and guar gum is also strong with increasing export demand. Good quality of guar seed is traded at Rs 4200/100Kg and average quality guar seed is traded at Rs 4100/100 Kg. Standard quality guar gum is traded at Rs 9000/100 kg. In interior location, guar is traded up to 4000/100 Kg. guar seed is being traded strongly in the future market. At NCDEX (National Commodity & Derivatives Exchange Ltd) guar seed-10MT is being traded at Rs 4179, 4207, 4259 higher by 0.52 percent or INR 21.5/100 Kg, 0.56 percent or INR 23.5/100 Kg, 0.64 percent or INR 27/100 Kg with open interest of 108170, 40380, 5330 for April May and Jun month contracts. Guar gum is being also traded upward in the future market. At NCDEX (National Commodity & Derivatives Exchange Ltd) Guar gum- 5MT is being traded at Rs 8900, 9000 higher by 0.74 percent or Rs 65/100Kg, 0.57 percent or Rs 51/100 with an open interest of 47100, 18145 for April and May months contract. Guar gum prices will rise with Increasing crude oil price above USD 70/Barrel. Crude oil prices are going up with increasing tension between Saudi Arabia and Iran. Saudi prince is in the USA for further discussion on power balance with IRAN. USD is also weak in the international forex market. Price of Brent crude oil has reached the level of 69.47 USD/barrel and WTI crude oil has reached to the level of 65.71 USD/barrel. 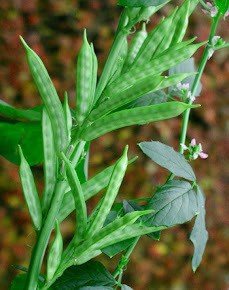 Guar is an industrial commodity. This is the demand driven commodity. Major portion of guar gum powder is used in Oil and Natural Gas Industry in the fracking process. Currently, fracking activities are active in USA. Guar gum is used in bulk quantity in the fracking process. 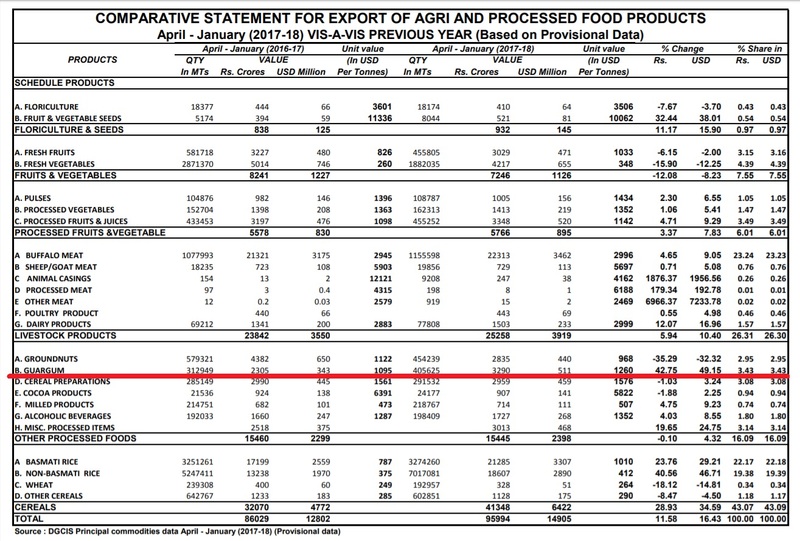 As per available export data, export of guar gum has increased by 49.17%. Arrival of Guar has almost gone down. It is time for Rabi harvesting. Remaining arrival of guar in market will also stop. There is news that speculators are active and trying to manipulate the market. Farmers and Traders must keep away from speculative news, this year Guar will perform as per strong fundamentals. 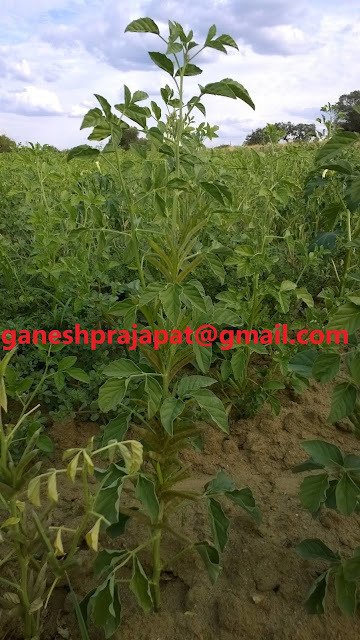 Production and demand both are positive for strong future of guar. Guar seed and guar gum are strong in the local market. Guar seed and guar gum are quoted high in the local market. Future trading is also strong since yesterday. Good quality of guar seed is traded at Rs 4300/100Kg and average quality guar seed is traded at Rs 4200/100 Kg. Standard quality guar gum is traded at Rs 9000/100 kg. In interior location, guar is traded up to 4000/100 Kg. guar seed is being traded strongly in the future market. At NCDEX (National Commodity & Derivatives Exchange Ltd) guar seed-10MT is being traded at Rs 4223, 4243, 4291 higher by 1 percent or INR 42/100 Kg, 0.81 percent or INR 34/100 Kg, 0.29 percent or INR 12.5/100 Kg with open interest of 125290, 30830, 3590 for April May and Jun month. Guar gum is being traded strong in the future market. At NCDEX (National Commodity & Derivatives Exchange Ltd) Guar gum- 5MT is being traded at Rs 9010, 9125, 9212 higher by 0.9 percent or Rs 80/100Kg, 1.04 percent or Rs 94/100, 0.56 percent or Rs 51/100 Kg with an open interest of 56345, 10150, 45 for April May and Jun month contract. As per export data released by APEDA value of export of Guar gum has increased by 49.15%. During this financial year, Guar gum export from April-17 to January-18 was 4,05,625 MT. Last year during the same period from April-16 to the January-17 export of Guar gum was 3,12,949 MT only. There is an increase of 92,676 MT or 29.61 % in quantity of Guar gum products for the same period from April- to January. Last year from April- 2016 to January-2017, we exported Guar gum, values of INR 2305,00,00,000 (2305 crore) or 343 Million USD, for the same period during this year from April-17 to January-18 India exported Guar gum value of INR 3290,00,00,000 (3290 Crore) or 511 Million USD. Last year from April-16 to the January-17-unit value of Guar gum export was 1095 USD/MT this year for the same period from April-17 to the January-18-unit value of Guar gum export is 1260 USD/MT. In Indian rupees, there is an increase of 42.75% INR and in USD it is an increase of 49.15% in value of export of guar gum. Only in the January-18 month, there was an export of 40,170 MT of Guar gum. Export of Guar gum will keep increasing with increase and stability of crude oil prices. Crude oil prices have stabilized during February month. Oil companies in the USA are continuously increasing their production of crude oil through hydraulic fracturing/fracking process even OPEC has decided to cut the oil production. Prices of crude oil are stable due to production cut by OPEC even Shale oil production in USA is increasing. Shale crude oil production industry in the USA encashing the scenario of crude oil production cut by the OPEC. Guar seed and guar gum price were on the downward trend during this week (5th March- 10th March). On Friday there was little bit recovery in Guar seed Price and guar gum price. There is tension among the farmers, traders and stocking due to the sharp drop in Guar seed Price and guar gum price after having al the fundamentals positive. Business activities remained sluggish due to the budget year ending closing. Crude oil price and shale crude oil production through the fracking process is the major fundamental factor for Guar seed Price and guar gum price movement. One time there was the critical concern when guar gum prices fell below the 9000 level. 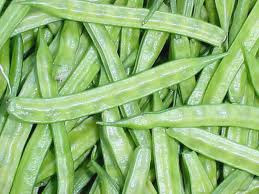 Guar gum is the major industrial product, if Guar gum prices fall sharply then Guar seed can be stable for a long time. By the Friday Guar seed and guar gum price recovered in the future market. There was the recovery of 88 Rs/100 Kg in Guar gum and March contract closed at INR 8949/100Kg. 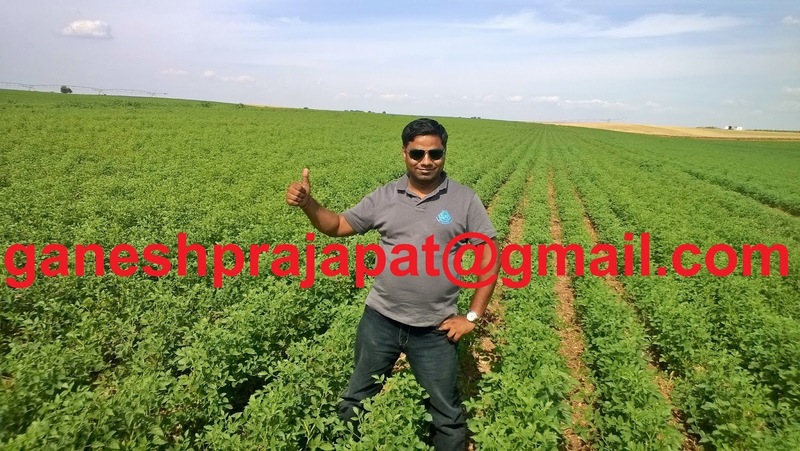 Guar seed march contract closed at INR 4262 with the recovery of INR 28/100Kg. Crude oil prices have also shown recovery in the international market. On Friday closing there was the recovery of USD 1.88 USD/Barrel or 2.87% in crude oil prices and crude closed at 65.49 USD/barrel. Geopolitics is also improving. The tension between the USA and North Korea has little bit soft after winter Olympic. There is the indication of direct political talk between the USA and North Korea. Stability in international politics and war zones will lead to financial stability and economic growth. Guar seed and guar gum price may remain stable for some days. The exporter will start sourcing guar seed for new guar gum export order. The arrival of guar seed has gone down. Most of guar seed production for this year has been processed or stocked for long-term investment. After three months sowing of the new crop of guar will start there will be the requirement of Guar seed for sowing purpose. New guar seed crop will arrive after 8 months. This year there is no oversupply of guar seed in the market. Speculators are active; traders and stockist must avoid speculative movements. The arrival of guar has dropped lower than 15,000 Bags per day. Farmers are not carrying guar commodity to market as they are busy in farm works. Rabi crops are ready for harvest. Good quality of guar seed is traded at Rs 4300/100Kg and average quality guar seed is traded at Rs 4100/100 Kg. Standard quality guar gum is traded at Rs 9000/100 kg. In interior location, guar is traded up to 4000/100 Kg. guar seed was closed strong in the future market. At NCDEX (National Commodity & Derivatives Exchange Ltd) guar seed-10MT is being traded strong at Rs 4262, 4265, 4290 higher by 0.66 percent or INR 28/100 Kg, 0.9 percent or INR 38/100 Kg, 0.88 percent or INR 37.5/100 Kg with open interest of 20640, 138000, 162240 for March, April and May month. Guar gum is being traded strongly in the future market. At NCDEX (National Commodity & Derivatives Exchange Ltd) Guar gum- 5MT is being traded at Rs 8949, 9050, 9139 lower by 0.99 percent or Rs 88/100Kg, 1.13 percent or Rs 101/100 Kg, 1.08 percent or Rs 98/100 Kg with open interest of 4390, 64980, 2240 for March, April and May contract. Guar seed price and guar gum price are downward in this month in the forward market due to instability in the stock market and falling crude oil prices. Guar seed and guar gum price are stable in the local mandi. Guar seed and guar gum business are sluggish local markets. Guar seed price and guar gum price are fundamentally strong. There is global demand due to stable crude oil prices and increase crude oil production by the fracking process. It is confirmed that the USA will be largest crude oil producer in coming days by the fracking process. Guar gum demand will increase with increasing fracking process. In current week prices of crude oil price is falling in the international market as the inventory of crude oil is increasing in the USA. OPEC and other oil-producing countries are committed to decreasing the crude oil production. There is some sentimental pressure of crude oil prices on upward movement of Guar seed and guar gum price. Businesses are also sluggish due to the year ending closing. Govt has summoned the Head of banks due to some financial irregularities in the banking system. In recent scam involvement of banks have come in news due to this there is a downward trend in the stock market and the same effect is coming in the commodity market. The arrival of Guar seed is very poor in local markets. It will remain poor as major arrival period has gone. After 15-20 days the arrival of Rabi crop will start, and the arrival of guar will stop completely. Most of the grain merchant will be busy in trading and buying of Rabi commodity. This year Churi Korma is also performing better. Prices of Guar Churi Korma is better than previous years. It is trading around 2700/Quintal. Guar seed and guar gum price are not performing as per fundamental of factors. March expectation was around 5000/100Kg for guar seed. Guar Gum is performing poor due to poor demand. Good quality of guar seed is traded at Rs 4300/100Kg and average quality guar seed is traded at Rs 4200/100 Kg. Standard quality guar gum is traded at Rs 9300/100 kg. In interior location, guar is traded up to 4000/100 Kg. Guar seed is being traded week in the future market. At NCDEX (National Commodity & Derivatives Exchange Ltd) guar seed-10MT is being traded at Rs 4252, 4247, 4270 lower by 1.09 percent or INR 47/100 Kg, 1.3 percent or INR 56/100 Kg, 1.47 percent or INR 63.5/100 Kg with open interest of 37330, 135950, 9140 for March , April and May months. Guar gum is being traded weak in the future market. At NCDEX (National Commodity & Derivatives Exchange Ltd) Guar gum- 5MT is being traded at Rs 8870, 8962, 9048 lower by 1.63 percent or Rs 147/100Kg, 1.7 percent or Rs 155/100 Kg, 1.79 percent or Rs 165/100 Kg with open interest of 13015, 61390, 1225 for March, April and May contract. 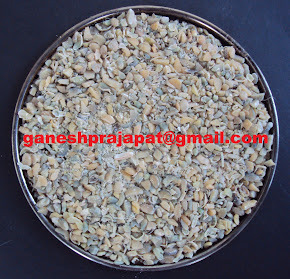 Guar seed and guar gum price, are low especially the Guar gum. Generally, March month is the closing month. New business activities always remain low. The demand for Guar will increase with increasing fracking activities. New export data will come for January and February month. 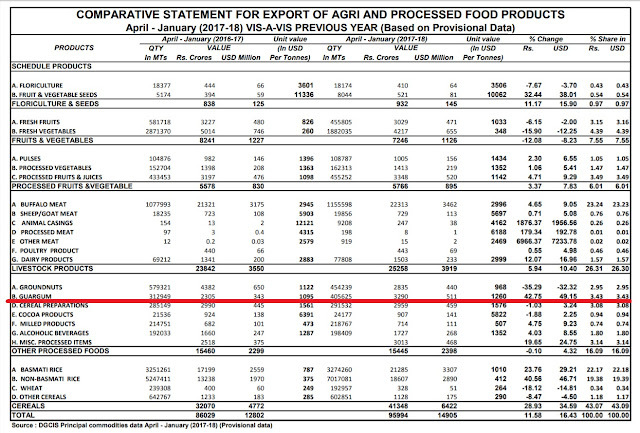 These data will coem very posative for Guar gum and other guar product export. Guar gum and Guar product export will increase. This year 3,65,451 MT of Guar gum has been exported till December-2017. It generated 458 Million USD Foreign Exchange for India. In Indian rupees, it was export of 2640 Crore Rupees. It was 48.43 % higher than the previous year till the same period in Indian rupees. This year average per unit export value until December is 1253 USD/MT. Last year average unit expo value was 1098 USD/MT. As per market men, export data will positive for rest of period. The demand for guar gum will keep increasing with increased drilling activities. Crude oil prices are above the economic level for the oil drilling companies in the USA. Very soon the USA will be number one crude oil exporter in world by suppressing Saudi Arabia and Russia. OPEC and Russia are committed to cut down production to control the falling prices, but another side USA is using this opportunity to capture the crude oil market. Somewhere the USA is successful in its goal. Supply of Guar gum has become limited at this time. Major arrival has gone down, and the New crop will come after 8-9 Months. After three months there will requirement of Guar seed for sowing in the large rainfed geographical area. Next two month will deficit month for guar seed in the market. Farmers and traders should use this opportunity by making the supply limited to market. In the future market contract of 2 crore bags are being traded. In actual, there was the production of 70-80 lac bags of Guar after adding carryover stock of previous year figures reaches around 1.5 crore bags, these numbers are not sufficient to match the traded commodity in the Future market. By this time major production of this year has been processed or stocked. 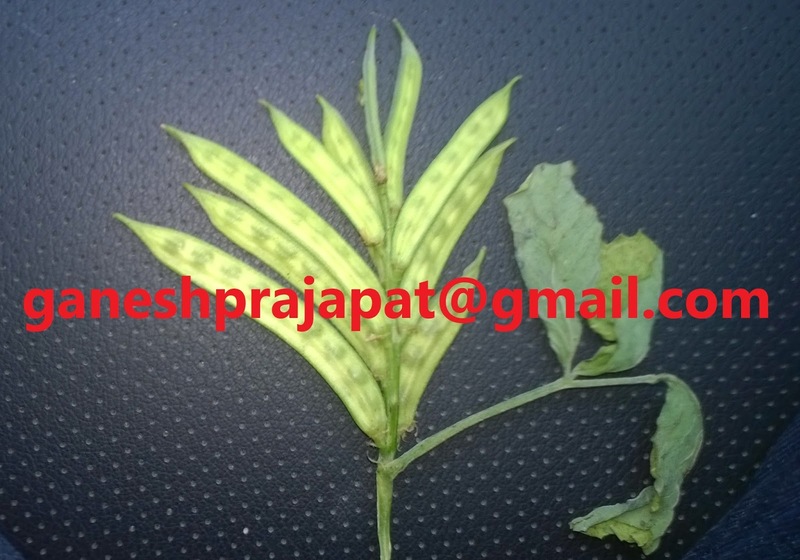 A limited quantity of guar is available for open market trade. Production of Guar seed for next year is also predicted to remain low as Govt will give good MSP for Kharif pulses. And farmers will move to edible Kharif pulses cultivation instead of Guar cultivation. The market will depend on rainfed cultivation. Avoid speculative message and movement. The market for guar seed and guar gum is very strong. Speculators are trying to capture the market. This Year Guar will give the good return. All the fundamentals of demand and supply side, are positive.